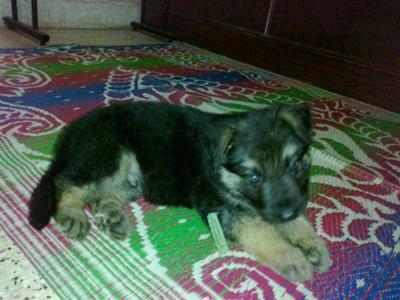 Rocky - The super German Shepherd dog!! hey guys! rocky is my first GSD puppy!!! its very very active, but the only problem is that it bites us a lot! so how do i get rid of this problem? This is very common and a very normal behavior too for a young GSD puppy (or any young puppy for that matter). And there are several things you can try to get your puppy to stop the mouthing you. Such as - put a toy in their mouth when they start acting like they're going to nibble on you, don't wrestle or play fight - it can often encourage biting, your puppy may be teething, etc. If I were you I would also talk to a dog trainer in your area and ask for a few more tips on stopping the biting behavior too. Plus, here is an article with even more ideas on correcting Puppy Biting problems. And do yourself a favor - stock up on lots of puppy chew toys because rocky is going to be chewing for a while to come. Good luck!